The processing and mechanical behaviour of bulk nanostructured materials are one of the most interesting new fields of research on advanced materials systems. Many nanocrystalline materials possess very high strength with still good ductility, and exhibit high values of fatigue resistance and fracture toughness. There has been continuing interest in these nanomaterials for use in structural and biomedical applications, and this has led to a large number of research programs worldwide. 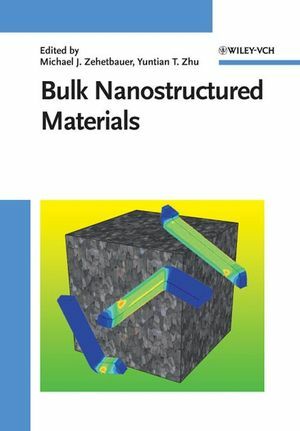 This book focuses on the processing techniques, microstructures, mechanical and physical properties, and applications of bulk nanostructured materials, as well as related fundamental issues. Only since recently can such bulk nanostructured materials be produced in large bulk dimensions, which opens the door to their commercial applications. Michael Zehetbauer is Professor for Materials Physics at the University of Vienna, where he heads the section on "Nanocrystalline Materials". His research focuses on severe plastic deformation of metals and the characterization of ultrafine grained and/or nanocrystalline structures by X-ray and synchrotron radiation. He was organizer of the Second International Conference on Nanomaterials by Severe Plastic Deformation, held in Vienna in 2003. Yuntian T. Zhu is Professor in the Materials Science and Technology Division at the Los Alamos National Laboratory. His work concentrates on processing and characterization of bulk nanostructured materials and he is also active in research related to carbon nanotubes. Yuntian Zhu was co-organizer of four symposia on ultrafine grained materials.